Unfortunately, we seem to be in a time when very few dogs are receiving the socialization or training they need to be good companions and good canine citizens. I see a lot of dogs that are reactive to a large majority of situations. And, I see a lot of dogs that are severely dog aggressive. Ironically, I had a horrible experience in my own yard just the other day. My brother’s dogs were outside in the back yard. I was getting ready to go to the gym, but I knew my girl Fury needed to go out, so I let her out in our front yard. She had her two front paws on our deck, and her two back paws in the grass, squatting to pee when I heard the neighbor dog growl, as he dug his nails into the cement of the driveway to come and attack my dog. As he did so, I could hear the neighbor lady yelling about how he is really a friendly dog. Luckily, 25+ years as a professional dog trainer and over 15 as a veterinary technician has given me some quick reflexes, and thankfully my dog was within arm’s length. I grabbed her by her scruff (she is 60 pounds), opened the door, and threw her inside, simply by instinct. He came at us so fast I had to shut him in my own front door to get him to back away. And, although I thought I already knew a lot about deterring loose dogs, I learned even more from this experience. Although I yelled at the owner to get the dog, and then at the dog, and stomped toward him, he was hell-bent on attacking my dog. Had I not intervened so quickly and been able to get her inside, there would have been a horrible dog fight. Even after shutting him out for a few moments, when I went to exit the front door he was still there trying to get inside. He literally would have come into my house and attacked my dog! He could have killed my dog. It was at that moment that I decided to always be prepared. I would do anything for my dog. I would have even been willing to commit violence on her behalf. I have become nervous about walking my dogs in neighborhoods. But I never thought I had to fear for them in my yard, or that a dog would come into my house. My first line of defense has always been to put my dogs in a “down stay” so that I can stomp at and yell at the charging dog, as well as yelling for the owner. 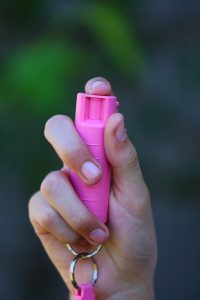 My second line of defense has always been pepper spray. Yes, I would have pepper sprayed them both if I had to; it is better than having a dead dog. I will also be walking with a weapon. I hate to say it, but I would use one if I had to, to save my dog’s life. You must be mentally prepared to deal with the situation. I will also never leave without carrying my phone. I have often been on walks around the neighborhood without my phone. I realize I may need it to call the police. Beyond all that, which is critically important, what is THE best defense? If my dog had been at all dog aggressive or reactive, or if I hadn’t been able to control her, I would have lost the war. The fact that my dog listened and respected me is a key piece in saving her life that day. I can try to control or deter the other dog, but the truth is that the only dog I have control over is my own. And, two dogs that are dog aggressive or dog reactive are going to have a much, much worse fight! Keep your dog on a leash and near you. 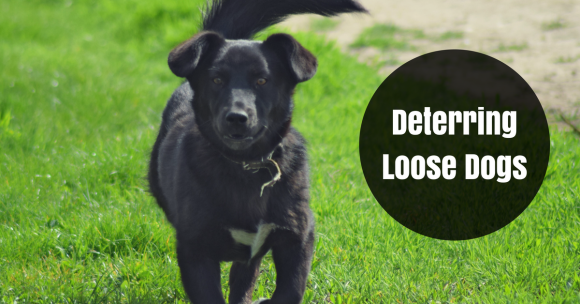 If your dog is off leash and far away from you, you have no control. If there is an altercation, you don’t want to have the dog that was off leash, because being off leash in most places is illegal. It is sad to admit, but we live in a different world than we did just 15 years ago. You must prepare to deal with the dogs of today and the problems they have, and not be in denial. Behavior gives us a lot of information (despite what owners say). Use that information to prepare yourself!